We had a nice family movie night as our friends at Shout! 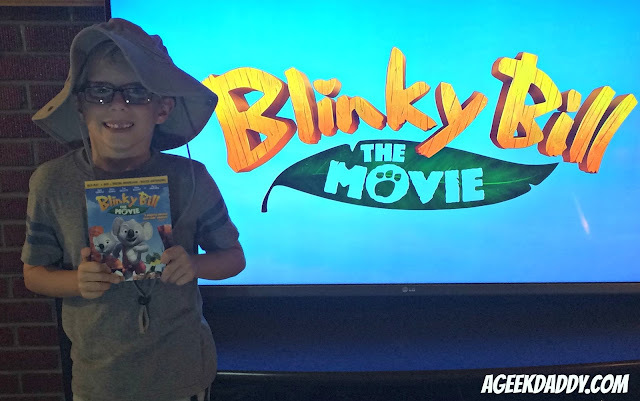 Factory introduced us to one of Australia's most recognized characters, an adventurous koala named Blinky Bill, by sending us a copy of BLINKY BILL -- THE MOVIE before its official release on blu-ray and dvd. The Adventures of Blinky Bill is a beloved children's book series in Australia and he has also been featured in television series and movies Down Under. Now Shout! Factory is importing him to America with the blu-ray, dvd, and digital download release of BLINKY BILL -- THE MOVIE within the United States on October 11, 2016. Endorsed by the Dove Foundation as family friendly entertainment, BLINKY BILL-- THE MOVIE really is an enjoyable romp through the Outback featuring an entertaining ensemble of animated animal characters that children will adore including kangaroos, koalas, emus, frill-necked lizards, kookaburras, and a wombat who drives a wicked tricked out pickup truck. In addition to providing an exciting adventure story, the movie is also filled with important lessons on the importance of community, survival in harsh climate, the love between children and parents, and 'mateship' -- an Australian cultural idiom that embodies equality, loyalty, and friendship. 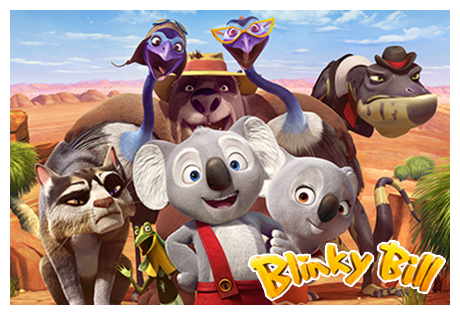 Our family may not be that fond of Vegemite but after watching this movie we're now very big fans of another quintessential Australian favorite -- Blinky Bill. To share my family's enjoyment of BLINKY BILL -- THE MOVIE, A Geek Daddy is giving away a Blu-ray/DVD/Digital to one one lucky winner. To be eligible for this giveaway you must follow @Geekdad248 on Twitter and retweet our original contest tweet embedded below before October 10, 2016 @ 11:59 pm EST. Must be a US resident over the age of 18 to participate. No P.O. Boxes allowed for delivery of the prize. One entry per person and winner will be randomly selected from all eligible entries. Shout! Factory will be responsible for the delivery of the prize to the selected winner. Each household is only eligible to win once via blog giveaways. If you have won this movie on another blog, you will not be eligible to win it again and the prize will be forfeited. Winner is subject to eligibility verification. By participating in this promotion you waive any liability of any kind against the publisher of this blog. A Geek Daddy is providing this giveaway contest as a benefit to our readers and social media followers and has not been financially compensated for this promotion. Blinky Bill is a little koala with a big imagination. An adventurer at heart, he dreams of leaving the little town of Green Patch and following in his missing father's footsteps. Mr. Bill went missing in the Outback some time ago and Blinky is the only one who believes his father is still alive. When Blinky discovers a mysterious marker that hints at his dad's whereabouts, he embarks on a journey that takes him beyond the boundary of Green Patch and into the wild and dangerous Outback. He quickly makes friends with Nutsy, a zoo koala, and Jacko, a nervous frill-necked lizard. Pursued relentlessly by a vengeful cat who has a personal score to settle with Blinky, the trio must learn to work together if they ever want to survive the rugged Australian landscape and find Blinky's father!